The body of the stein is a smooth, two-tone blue and white glazed, high quality stoneware decorated with a gold wrap around design. 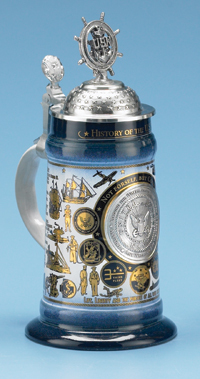 Created in honor of the soldiers of the U.S. Navy, this stein details a timeline of major events and accomplishments throughout the history of the Navy. A pewter badge displaying a Navy seal design encircled in the words Around The World, Around The Clock - Any Time - Any Where - Any Weather, appears at the center of the wrap around decoration opposite the handle of the stein. Rows of raised stars decorate the ornamental pewter lid and fixed to the top is a figural design of a Navy emblem featuring a steering wheel and anchor. A pewter version of the U.S. eagle crest serves as the thumblift for this noble stein. Limited Edition of 5,000 pieces worldwide.